That was a significant statement. His promised “change” brightened America’s “hope." Was Obama projecting changes of such Biblical proportions? There is almost no area of American life in which the political elites’ influence is not transforming its citizens’ lives and the way they are governed. During his first term in office Obama’s political focus was on the alleged “mending what his predecessor” had “torn,” especially in the economy and in job loss. But – another agenda was waiting in the wings, now beginning to emerge in his second term: centralize power in the executive branch. Contrary to main-stream media reports, these became significantly worse under Obama compared to his predecessor. During his first term in office, Obama increased the national debt through fiat money as much as had all prior presidents from George Washington through George Bush combined. This opened the door for him to quell any opposition “when necessary,” including what has now become apparent, a growing hatred for the “standards” of conservative Christians and Tea Party members. Adding insult to the nation’s “right to know” was the loss of Lois Lerner’s emails from a “computer crash.” The unique block of time investigators needed was “lost.” Now it is reported that the IRS computer backup company was relieved of its responsibility shortly thereafter to eliminate their record. An interesting “twist” in public policy began early in the President’s second term. At a small elite gathering of 60 guests, he announced that he wanted to “institutionalize” a “crisis atmosphere in America” to move forward his agenda. Former Secretary of State Hillary Clinton also previously said, “Never waste a good crisis.” Such a “political opportunity” began with 47,000 unaccompanied children crossing into the United States in the past fiscal year. Nanci Pelosi urged Americans to see this as an “opportunity” (to create chaos – then an excuse to “control” events). In his book, Liberal Fascism: The Secret History of the American Left, which documents the origins and nature of fascist movements, columnist Jonah Goldberg notes that “The utility of terror was multi-faceted, but among its chief benefits was the tendency to maintain a permanent sense of crisis. It short-circuits debate and democratic deliberation.” (42-43). “This attorney general believes he can refuse to defend any law that he doesn’t like, and that’s the way he has approached his office. That is extremely dangerous. It violates separation of powers. It can tear apart the kind of constitutional structure we have, said von Spakovsky, citing Holder’s refusal to enforce immigration law, mandatory drug sentences and the Defense of Marriage Act. “Such communications must be possible under all circumstances to ensure national security, effectively manage emergencies and improve national resilience…. Michelle Obama recently told high-school graduates of Topeka, Kansas: Monitor your parents regarding racism. The Secret Service has now asked developers to submit proposals for new software that will detect sarcasm in the social media (the internet). Is a form of tyranny spreading its miasma over this country? Is Marxism knocking on the door? Could this be a “preface” to what John wrote in the Apocalypse: “And he had power to … cause that as many as would not worship the image of the beast should be killed and … that no man might buy or sell” (Revelation 13:15, 17)? Easy to ignore and fearful if not studied, such tyrannical power can’t simply happen overnight! It is prophecy of a progressive change, an incremental loss of freedom. There has to be a gradual “transformation” of American ideals to eventually be able to coerce citizens without a dysfunctional backlash. The TPP is part of the world’s elite, planning a soon-to-be-implemented New World Order. As will soon be apparent, the concepts of Marxism threaten the American democratic ideal. Disturbing is a similar dissection of democracy coming out of Rome. Ever since Pope Leo XIII’s encyclical, Rerum Novarum, a Roman Catholic “social doctrine” has been extending its tentacles throughout the world. The concepts are Marxist and sympathize with the “Progressive” agenda here in the United States. This is being studied by a growing number of political observers! “Pope Francis has openly attacked capitalism in his recently released apostolic exhortation [Evangelii Gaudium], which for all intents and purposes is the Pope’s ‘manifesto.’ … Much of it could have come from the hand of Karl Marx himself, minus the critique of ideology.” … His positions “would not be out of place in a Communist pamphlet.” Stunning! “Prior to Francis, if you asked someone on the street, ‘What is the Catholic Church all about? What does the Pope stand for?’ the response would be, ‘He is against abortion, gay marriage and birth control.’ Certainly in the media that was what has been portrayed, along with the horrendous scandal of cleric sexual abuse. “Today, the response would be different. ‘He is concerned about compassion, love, especially for the poor.’ He has even won over the media. The Church is making the front page for something other than criminal activity and scandal. This is a geopolitical smoke screen. On May 9, 2014, the executive officers of the United Nations met with Pope Francis at the Vatican (over 75 individuals! ), including those of the IMF, WTO and World Bank. The topics varied but all were geopolitical. 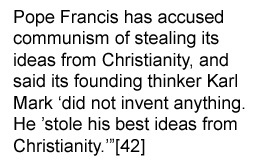 Francis focused on the New World Order paralleling the Catholic social doctrines (which are Marxist). Then he said, “To prevent the national leaders from wielding their considerable power unjustly the Catholic Church would also … [need] major power [to direct the world toward peace – a similar plea to that of Pope Benedict XVI in Caritas in Veritate].” Interesting! “What Doherty says of the Pope can be said just as easily of almost any Democratic politician in the United States. Democrats, especially among election time when they are busy courting the Christian vote, spare no occasion to put a Gospel dress on their socialism — all the while refraining from criticizing ‘capitalism’ by name. They are all in favor of ‘a God-centered ethic’ then. “There is more. This Pope has made comments regarding our economic system that can and have been made quite frequently by socialists of various stripes. “Where have we heard this lingo before? We are reminded that prophecy strongly portrays a world coalition, headed by the papacy, will emerge and then bring persecution to God’s people (Revelation 17:12-13; 13:1, 7-8). This is evolving as you read this document. An earth beast leader is centralizing its power – false prophet. Soon to appear is a sea-beast leader – the antichrist. He will be jostling for geopolitical control, as he is more than “hinting” right now. The Bible says that the United States will be the antichrist facilitator – that false prophet. “Looking across the landscape of Obama’s bold record of executive action, highly respected Attorney Turley of George Washington University doesn't mince words. Bob Unruh recently observed that the forensic profiler, Andrew G. Hodges, M.D., had pointed concern for what Obama was saying and doing. He warned that “martial law” imagery constantly arises in the President’s words and actions. As examples, Hodges said that objective actions that fit this pattern include the government’s purchase of 1.6 billion rounds of ammunition, the estimated 145,000 federal agents with firearm-carry authority, including the 65,000 agents for the Department of Homeland Security alone. “What exactly was he thinking and why? Undeniably this was extreme: a civilian force just as well funded and strong as our military – implying majorly armed. The question is what exactly was Obama secretly confessing about his future plans? Wayne A. Root was a classmate of Obama at Columbia University. He said: “We were taught how to overwhelm the system until the economy collapses with spending, debt, and entitlements.” Obama is a “stealth Marxist,” he continued. “As part of the new illegal ObamaCare directive to postpone the law for businesses with 50 to 99 employees, Obama put the IRS in direct control of critical U.S. business decisions. He demanded that businesses must ‘justify’ hiring and firing decisions to the IRS to qualify for the exemption. “Plain and simple, putting government in charge of the decisions of a private business is the very foundation of socialism. It is how economies like North Korea, Cuba, the old Soviet Union and East Germany have always been run. Tom Delay, former Texas congressman, said: “Americans now live ‘under a government of tyranny.’ … Redistribution of wealth is tyranny” [what we’ve seen in the Catholic Social Agenda]. “ANNUIT COEPTIS” means “He approves of our undertaking” (“He” is the “eye”). Who will be the ultimate “head”? An overseer of a world coalition: “These have one mind, and shall give their power and strength unto the beast” (Revelation 17:13). The “antichrist” is posturing. The tyranny of the earth beast expands. Eric Holder arrogantly testified before the House Judiciary Committee that he had a “vast amount” of discretion in which Federal laws are enforced! The commission ordered them to pay the lesbian couple $6,000. The Alliance Defending Freedom took up their case, which went to the New Mexico Supreme Court. The conviction was upheld – sadly. The U.S. Supreme Court declined to hear the case. That Court (April 7, 2014) let the case stand as per the original charge – thus, violating the couple’s religious convictions. They must now pay the fine, be willing to photograph homosexual couples or stop business. Privileges have become rights, which have become law, which can be used to legally undermine freedom of conscience. Thus, a federal precedent has been made. Adding deepening concern to this legal coercion invading our lives, Supreme Court Justice Antonin Scalia noted on February 4, 2014, in a speech at the University of Hawaii Law School, that “internment camps,” as seen in World War II, may be seen again. A chilling purge of Obama’s political enemies has begun. The forced early retirement of many of America’s best military leaders, the arrest of Dinesh D’Souza, the wiretapping of selected journalists and the public cry of New York governor Andrew Cuomo that conservatives have “no place in the state of New York,” all reveal this country’s moves toward tyranny. The evolution of power, shown in Revelation 13, is well under way. Cries for justice and even impeachment will fall on deaf ears. The trajectory has been set. The momentum makes it unstoppable. We are in the “time period” of Revelation 17:11-13. Soon the Revelation 13 sea beast will “arise.” The end will arrive soon thereafter. “What happens when people are seduced by government through handouts, government checks, government promises, and more? In Nazi Germany, Germans in the early 1930s were promised a return to the ‘glory days’ after the devastation of WWI. Government then started to paint picture of the good life returning, but only if government could become their god. “They hung onto every promise of ‘hope and change.’ … Hope and change agents always promise utopia…. “Here’s just a partial list of comparisons from Germany, 1938, to America, 2014. The demise of capitalism was fine and the rise of socialism was accepted. Few blinked when prayer was taken out of school in 1935. Daycare raised the children of Germany in the 1930s and 1940s. Christmas and Easter were taken out of the German public schools. Socialized medicine ruined the German healthcare system. The elderly and handicapped were marginalized. Abortion became the new normal and was even expected. Government spending skyrocketed and no one said a word. Taxation soared to 80%. First there was gun registration, but that was followed by gun confiscation by the Nazis. Free speech gradually faded. The newspapers and other media proclaimed the pro-government side of a story. The green agenda was adopted as it was steeped in paganism. Government spying went off the charts. Children sang songs of praise to Hitler. Germans were spellbound by the great oratory skills of Hitler. He couldn’t possibly be lying to them. The church in Germany did not want to make waves; it did not want to tackle controversy. Pulpits would never address serious issues or politics. The church in Germany was steered into mysticism such as today’s American pulpits that are okay with Christian Yoga-type deceptions. Hitler knew this would weaken the church and make it ineffective. Most, but not all churches in Germany, were riddled with compromise. Many pastors in Germany wanted to be popular and find favor with the government. They did not want to offend anyone. “The people in Nazi Germany saw Hitler’s tactics as a means to an end. Even anti-Semitism was accepted as it was a means to an end to get the German glory days back. “So what is the world coming to? What is America coming to? Exactly what the Bible predicted. We can delay the decay and be salt and light and spread the gospel while we have time. But government has become god to many in America and that is a bitter pill to swallow. God will stand for nothing or anyone coming before Him. “It’s easy to get comfortable with government. Human nature wants to be taken care of. It’s easy to let compromise gradually turn into tyranny and that’s a frog-in-the-kettle phenomenon. It never happens overnight. Fowler, Franklin S., Jr.; The Last Geopolitical “Order” (book) (Christian Heritage Foundation, Lucerne Valley, CA, 2014). Prager, Dennis; quoted by Charles Krauthammer, World Tribune Life, April 15, 2014. The Free Patriot, Economic News, January 14, 2014 (data from governmental sources). Ferrara, Peter; http://www.forbes.com/sites/peterferrara/2012/06/14/president-obama-the-biggest-government-spender-in-world-history/, June 14, 2012.
 http://www.whitehouse.gov/the-press-office/2012/07/06/executive-order-assignment-national-security-and-emergency-preparedness-. Friess, Steve; Politico, “Obama’s policy strategy: Ignore laws,” June 16, 2012. Unruh, Bob; World Net Daily, “‘2nd American revolution’ looming over free speech, May 7, 2014. Goldberg, Jonah; Liberal Fascism: The Secret History of the American Left from Mussolini to the Politics of Meaning (Doubleday, 2008). Treacher, Jim; Michelle Obama To High-School Grads: Monitor Your Parents For Thoughtcrime, http://dailycaller.com/2014/15/19/michelle-obama-to-high-school-grads-monitor-your-parents-for-thoughtcrime/#ixzz32JHFbahM. Posel, Susanne; The US Independent, June 4, 2014. The Huffington Post, August 21, 2013. Napolitano, Andrew P.; a former judge of the Superior Court of New Jersey, is the senior judicial analyst at Fox News Channel. Fowler, op. cit., p. 88. Vancouver Catholic Archbishop Michael Miller, The Search Intriguing, President Obama campaigned on “change” – this pope is changing the Roman Catholic World image! March 29, 2014. The Trumpet Weekly, May 16, 2014. See endtimeissues.com, May 3, 2014. Kathy Shaidle, World Net Daily, February 13, 2014. European Union Times, “World Leaders Wear Bizarre Illuminati Pyramid at Nuclear Summit,” March 31, 2014. Watson, Paul Joseph and Alex Jones; Infowars.com, January 26, 2014. Turley, Jonathan; reiterated in an open editorial piece in the LA Times, March 9, 2014. Agence France-Presse, June 29, 2014. Markell, Jan; Olive Tree Ministries, Inc., “Hope and Change: Haunting Comparisons,” pp. 3-4, www.olivetreeviews.org.